We will continue to add to this page so that we can cover all your questions. If you find that we have not covered a question that you may have, go to our contact us site. How much fiber loss will I have if I have my fleece pass through the Fiber separator/ De-hairing machine? This process is only on request. The amount of loss depends on the quality and cleanliness of the fiber. Loss can vary from 10% or less to as much as 50%. This process is recommended for all Llamas, older Alpacas or those with alot of guard hair or vegetation. This machine is designed to removes guard hair, vegetation, very short fibers and second cuts that may have been missed during skirting. This process dramatically improves the quality of your finished product. What does ready to spin mean? The fibers have not been combed or carded yet. But the fiber is fully cleaned and de-haired, thus ready to spin. A bump, is a roving that has been carded and is pulled through a tube. It is then slightly twisted into a long continuous fluffy looking thick rope. The roving is then spun onto a cilinder with a a center pull. The finished bump looks simular to a large cone of yarn. The roving is then pulled out of the bump from the center or the roving can be unraveled from the outside.This product is great for handspinners. This bump gives the handspinner control of the roving and helps to prevent the roving from becoming difficult to store. Roving not spun into a bump is looped by the yard into a can in a circular fashion then placed into a plastic bag loosely for shipping. How much over all fiber loss will I have from processing? Overall loss could be 10% to 50% depending on the condition of the fleece(s) and fiber length. Fiber loss starts at skirting and if there is alot of vegetation that needs to be removed or, 2nd cuts this increases the amount of loss. If you have alot of guard hair in the fleece you will loose fiber weight. If we feel your fiber loss will be high, we will contact you prior to processing your order. Those with high fiber losses that have usable waste, we will contact you and inquire if you want your waste back. It is a good idea and practice to skirt your fleece and clean as much vegetation out of it as possible. Then weigh each of your fleece prior to sending it off to a mill for processing. That way there is less of a suprise as to how much fiber loss you will have. Our policy is to charge the customer for finished product not, incoming weight. If I let my Alpacas cush down or lay in water alot when its hot, could it ruin the quality of my fleece at shearing time? Yes it can. The fiber can rott or become felted on the animal. Alpacas do like water and they also like to roll in the dirt. Wet or damp fiber and rolling can create a funny looking felted alpaca. However it could also create skin infections and other health problems for your animals besides being a nightmare for your shearer. 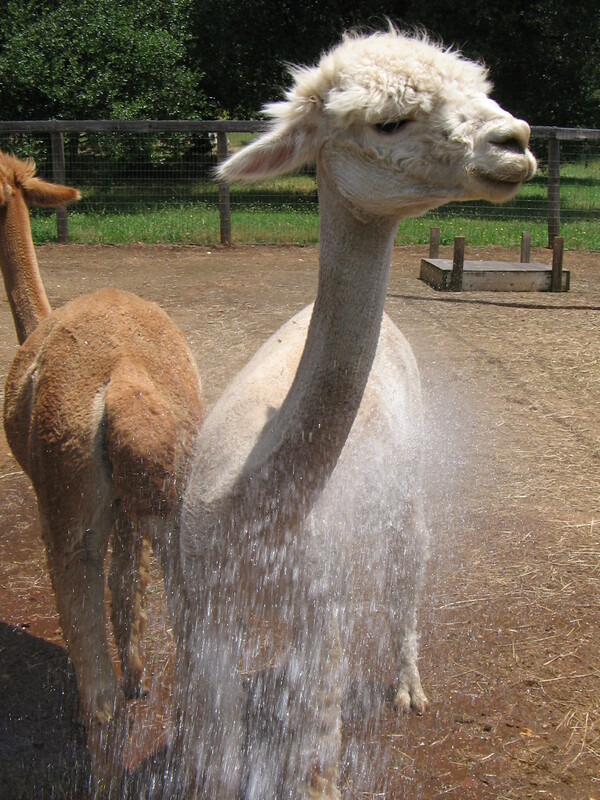 During hot weather spray or squirt the belly of your Alpaca, Llamas or camels where there bodies thermostat is located. This will cool them down and make them very happy. "Enjoying a sprinkle on a hot day"
If you have any question that we have not covered please feel free to contact us. We may add your question to our site to help others who may have the same questions.